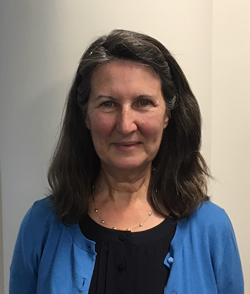 Beverley Gilligan, MA, MSW, LCSW is on the Social Work Faculty in the University Center of Excellence in Developmental Disabilities (UCEDD) and Leadership Education in Neurodevelopmental and Related Disabilities (LEND) at the Boston Children’s Hospital (BCH). She completed her studies at the University of Toronto, University of Guelph, and Wilfrid Laurier University, all in Ontario, Canada. She holds two Master’s, one in applied child psychology and one in clinical social work. Beverley first came to BCH as a LEND Fellow from a background in school psychology and community mental health. Currently, she is the Program Coordinator of the Fogarty/NIMH D43 Non-Communicative Diseases (NCD) Across the LIFESPAN Global Mental Health and Neurodevelopmental Disorders (Turkey/Azerbaijan), the Fogarty R25 Research Bioethics Initiative (Turkey/C. Asia) research training programs, and she is the Mentor and Coordinator of the UCEDD Diversity Fellowship with the Somali Development Center. Other projects in which she has contributed include a Grand Challenges Canada study of identification of children with neurodevelopmental disorder (0-36 months) in the National Program of Immunization, Lagos, Nigeria and the World Innovation Summit in Health (WISH) on Autism, Doha, Qatar.